Last summer's solar eclipse, also known as "The Great American Eclipse," was particularly special for ECE ILLINOIS Postdoctoral Research Associate Brian Harding. Harding set up an experiment for the eclipse's aftermath to hunt for evidence of a "long hypothesized atmospheric phenomenon, a giant wave traveling thousands of miles triggered by the abrupt night of the eclipse," as he explained to Newsweek. "As soon as it was over, I drove back to the city and opened up my computer and was making sure the instrument was taking data and everything," he said. 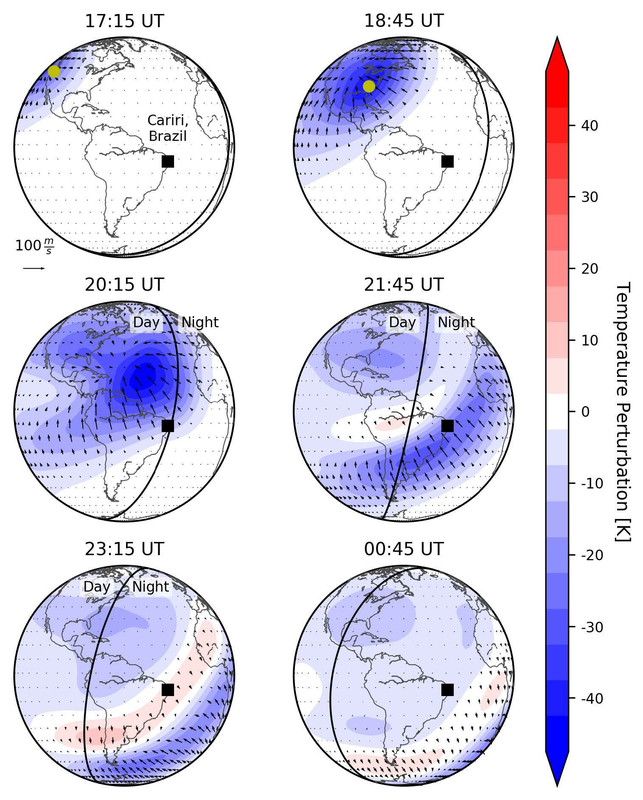 Harding, along with ECE Professor and Associate Dean for Undergraduate Programs Jonathan J Makela and researchers from the Naval Research Laboratory and Universidade Federal de Campna Grande, published their findings in "Nightside detection of a large-scale thermospheric wave generated by a solar eclipse" in the journal Geophysical Research Letters. 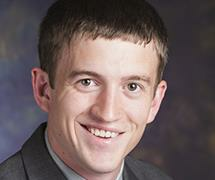 Makela is also affiliated with the Coordinated Science Lab at Illinois. They reported that their observations were successful, "backing up decades of scientific suspicion." While this was the second type of atmospheric wave that scientists identified from the eclipse, the first being called a "bow wave", Harding was searching for traces of significantly larger waves in the atmosphere that were "marked by wind-like movement of uncharged particles." TIME-GCM predictions of eclipse-generated thermospheric wind and temperature per- turbations (eclipse minus control) at a constant pressure level. When the moon passed above, its shadow abruptly cooled the atmosphere that it encompassed. That cool patch triggered a flow of atmospheric particles towards its center that allowed the researchers to collect their data. Harding was able to gather data from the eclipse with a stroke of luck. In early 2017, he visited a colleague "who had been modeling predictions for how the eclipse would affect the atmosphere" and according to Harding, "what I noticed was that we had an instrument that was right where it needed to be to make the measurement." Although the instrument needed some maintenance, Harding and his team were able to get it operating the day before the eclipse. As Harding added, "It's one of those times that science just works right." Read the original article from Newsweek here and more about the eclipse at Science News.